It’s always fun to be a tourist in your own city! 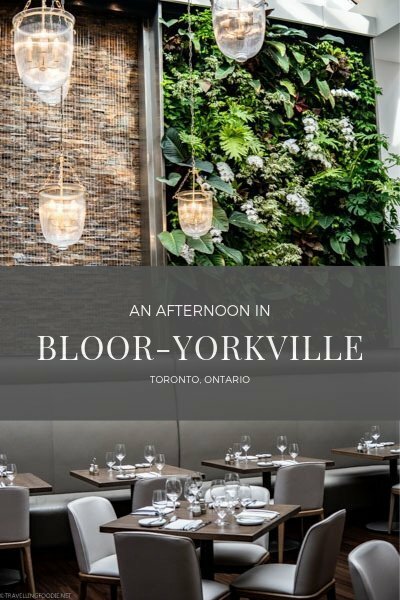 I’ve been to Bloor-Yorkville neighbourhood in Toronto so many times for events, food and coffee, but I never really knew much about the neighbourhood. 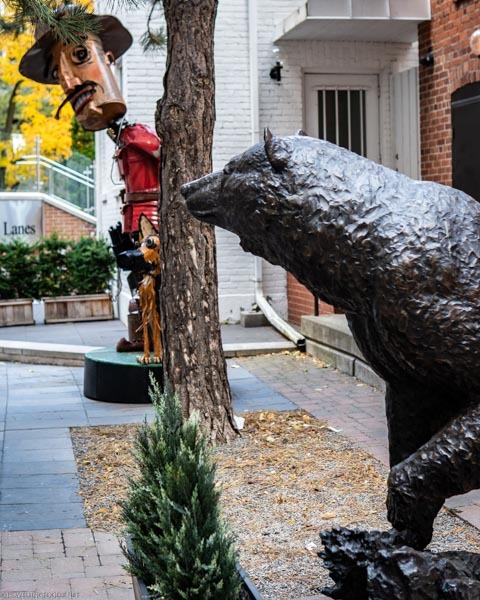 I got to spend an afternoon in Yorkville and had the chance to really explore the area, starting with a delicious lunch followed by a walking tour. 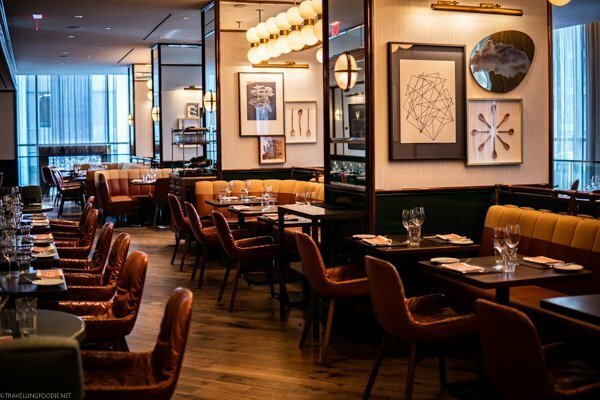 Here you’ll learn about some things to do, where to eat and places to stay in Yorkville. 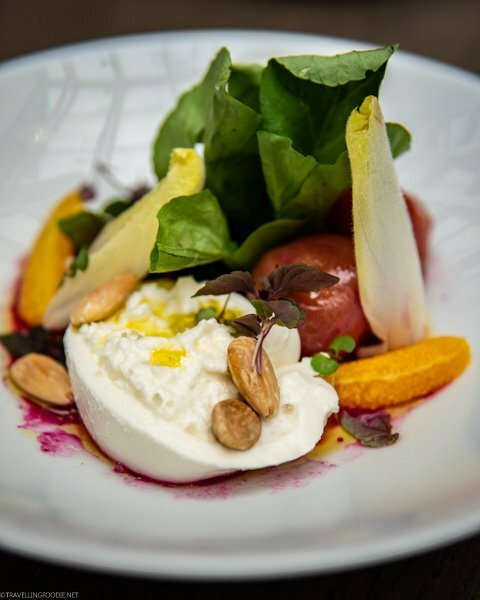 We started with lunch at Sassafraz Restaurant, which re-launched in October 3, 2018. 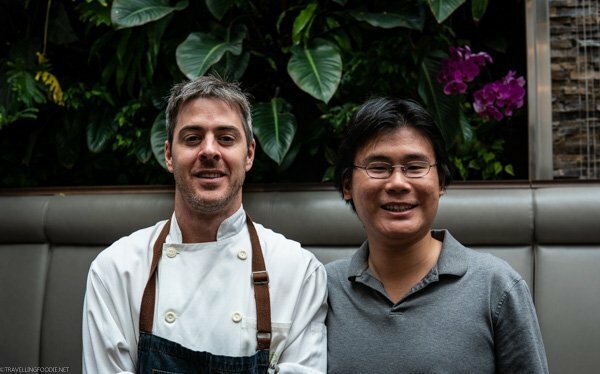 Serving for the past 20 years, this historic Yorkville restaurant has been re-imagined with a new design and market-driven menu. The sophisticated green sage exterior replaces the previous bright yellow exterior. 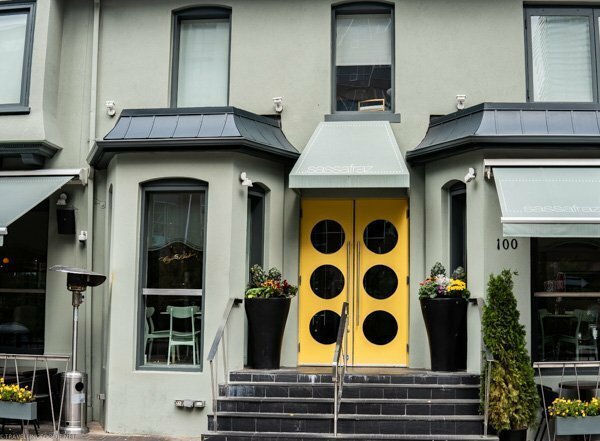 Only the doors have the iconic yellow, paying homage to the restaurant’s 20-year history. 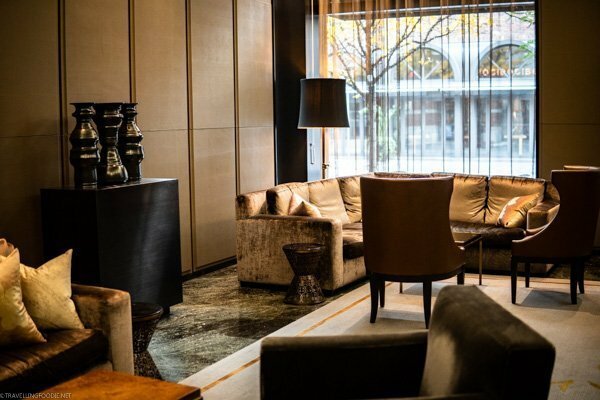 You have the bar and lounge area when you enter, followed by the dining room when you turn left. 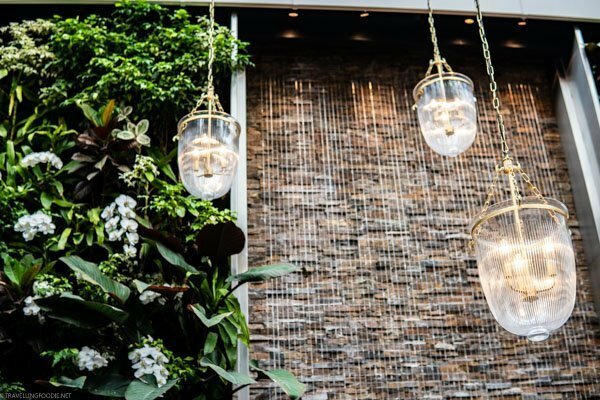 The best spot in the restaurant though is by the living wall, which is beautiful and has ample natural light for taking photos. 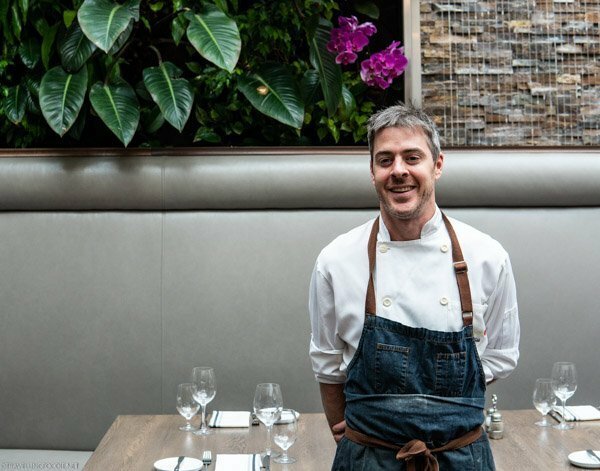 Executive Chef Geoff Webb has been working at Sassafraz for 13 years and has re-created the menu to an internationally inspired Canadian cuisine using seasonal and sustainable ingredients. 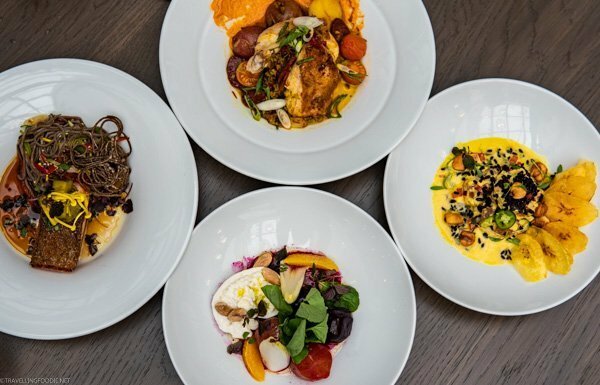 “Internationally inspired” is really emphasized in the dishes as we started with the ceviche, burrata salad, roast chicken breast and salmon. 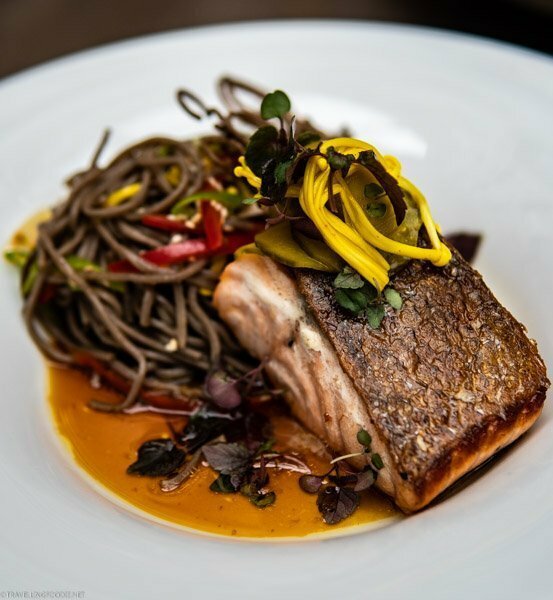 The perfectly cooked Cape D’or Salmon has Asian influences with the use of soba noodles, ponzu soy and enoki mushrooms. 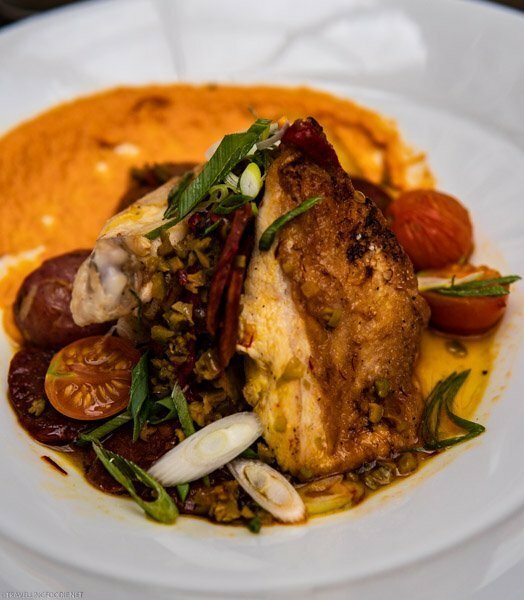 The fall dish, Harrison Co-op Roast Chicken Breast, brings a Spanish flair with the red pepper romesco and Spanish chorizo. Harrison Co-op is a group of farms in the Niagara region that raise chicken. 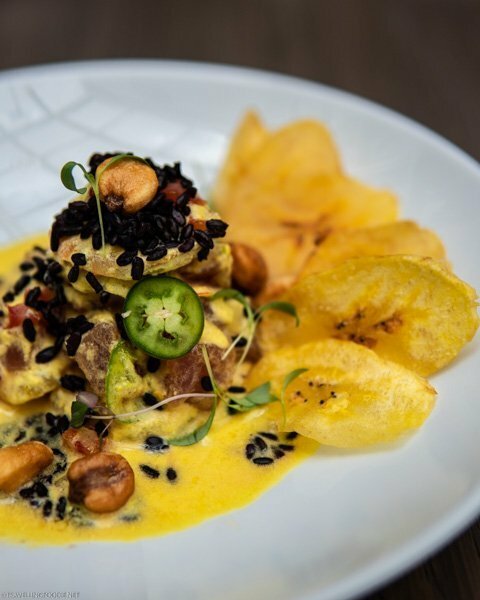 A very unique take on Mexican ceviche is the Tuna & Shrimp Ceviche which has a yuzu-based secret sauce that you’ll just have to try! 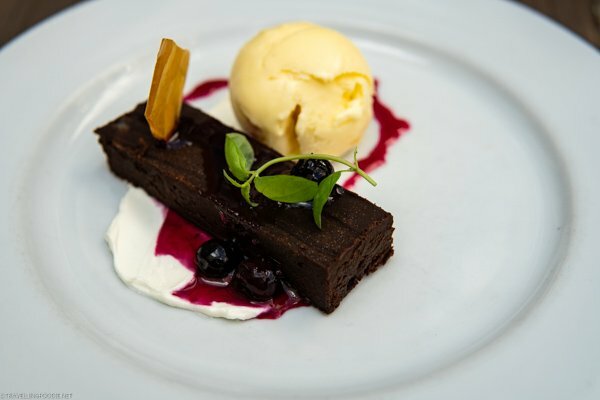 Interestingly, it also has forbidden rice, a historically rare black rice that is forbidden to eat except by the Chinese emperor. 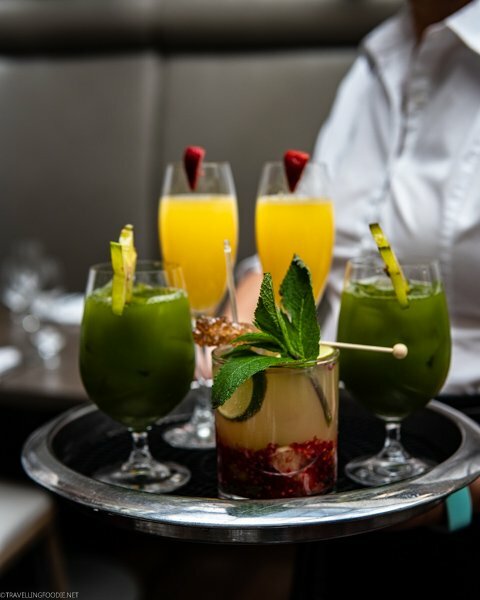 Their drink menu ranges from cocktails, wines and beers, to healthy juices and smoothies. The mimosa is quite strong. If you want a drink that’s insta-worthy, get the Badass Mojito. 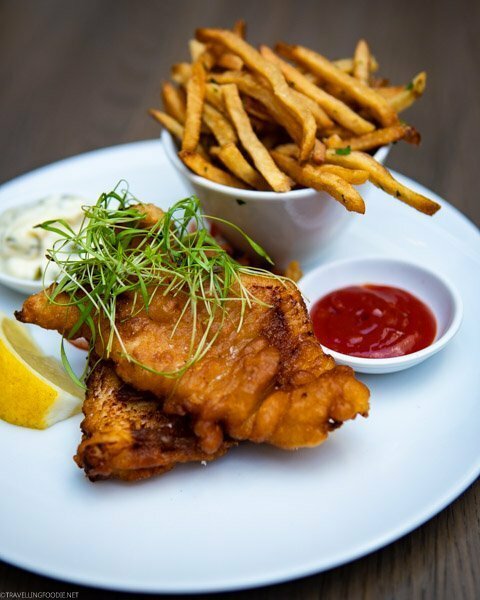 As everyone else ordered salad, I opted to try the Cod n Chips after learning that they use line-caught cod from Fogo Island! 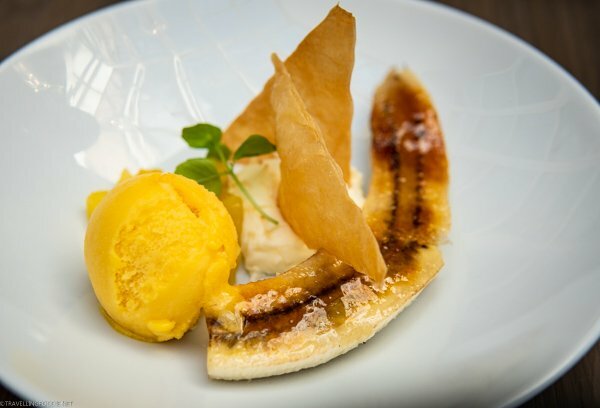 What made it even more special is the ginger batter the use on the fish – it was surprisingly delicious! 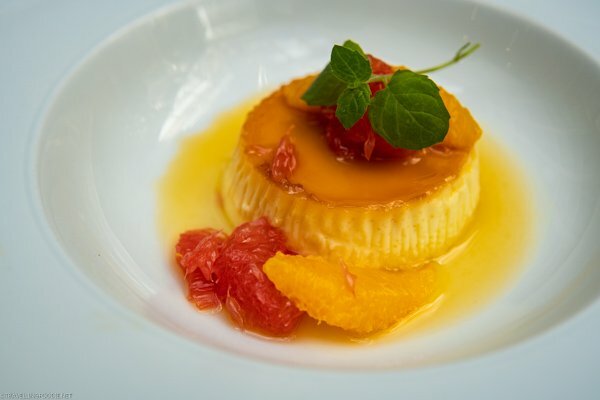 The must-try dessert here is the Lemon Crème Caramel, which was so smooth and creamy. The lemon was a refreshing welcome to balance the sweetness. After all that food, going on a walking tour was a great way to digest. 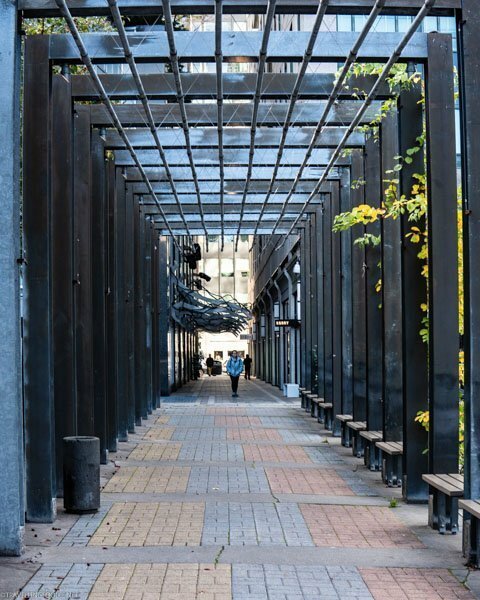 We did the On The Town Tours’ Discover Yorkville walking tour with guide Jane Herman, who is the President & Founder. 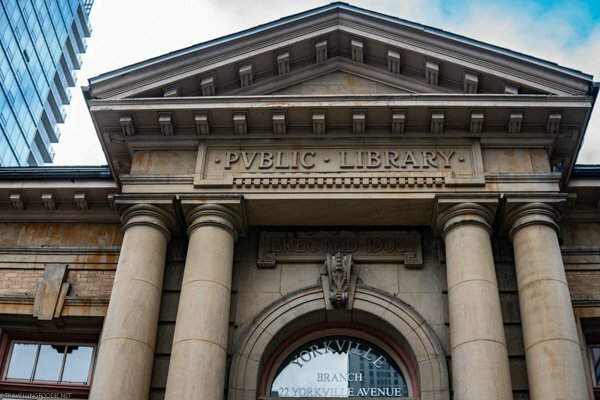 Jane is a wealth of information on Yorkville’s history, architecture and culture. 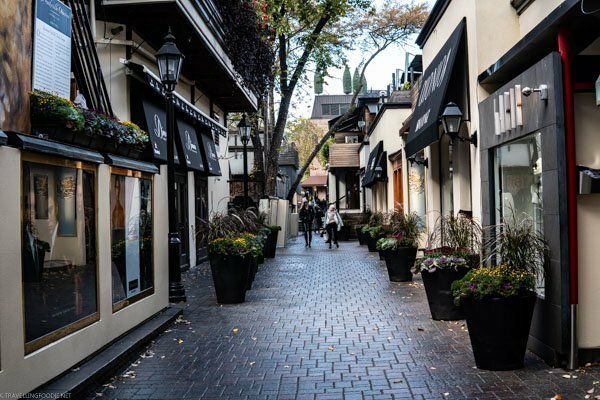 The Bloor-Yorkville neighbourhood is now known for being a glamorous and upscale shopping district with over 700 designer boutiques, trendy restaurants, luxury hotels and world-class galleries. But the neighbourhood is actually very historic. 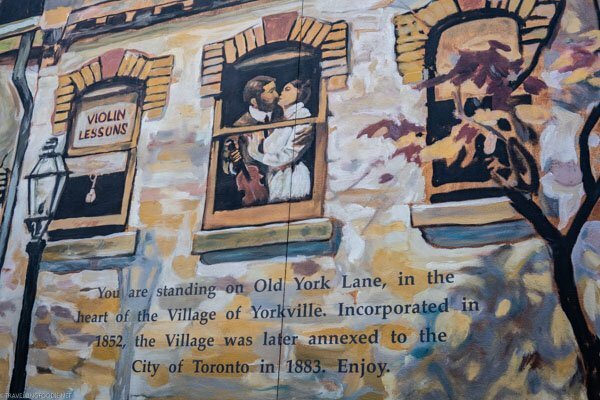 Yorkville was established as a village in 1830 by William Jarvis and Joseph Bloor, became an incorporated village in 1853, and annexed into Toronto in 1883. 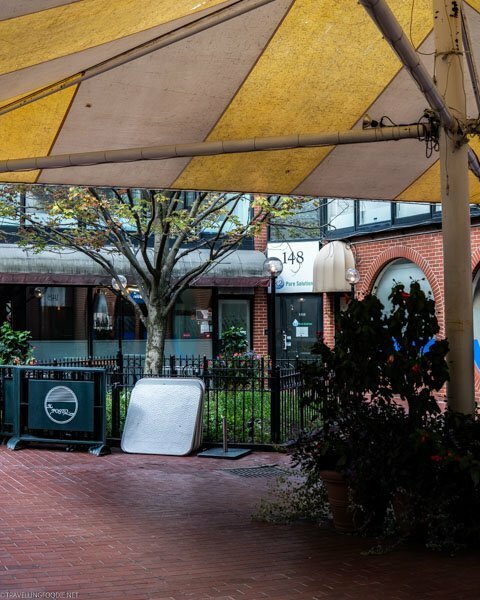 Once a mecca for hippies, Yorkville is losing its historic charm and character. New constructions are taking over the village, replacing the old Victorian houses with high-end condominiums. You’ll get to visit a lot of places throughout this 1.5-hour tour. 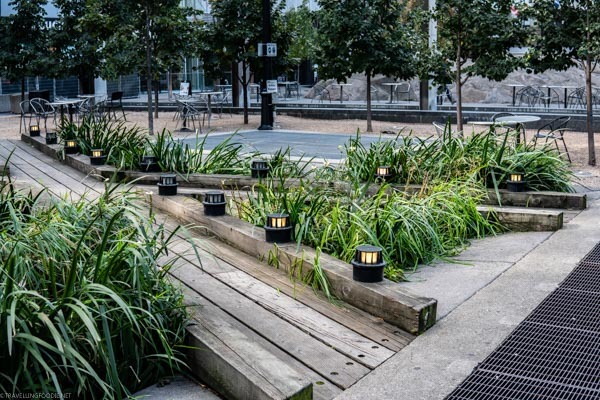 This includes popular ones like the Village of Yorkville Park, which is a local hangout spot, and the Yorkville Village, which used to be Hazelton Lanes that had a skating rink back in the 80s. Church of the Redeemer and the Four Seasons Renaissance Centre. 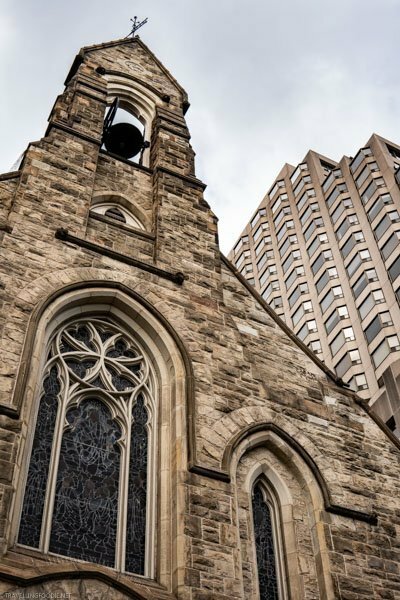 Due to financial difficulties, the church lands were sold to developers that built the Four Seasons Renaissance Centre on them. 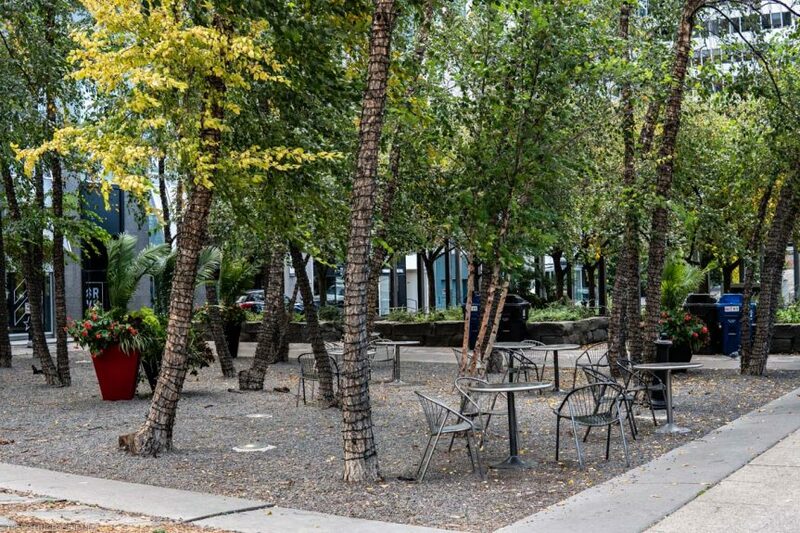 Used to be a parking lot, the Village of Yorkville Park completed in 1994 with eleven distinct garden plots based on the Victorian row houses that once stood on the same land. 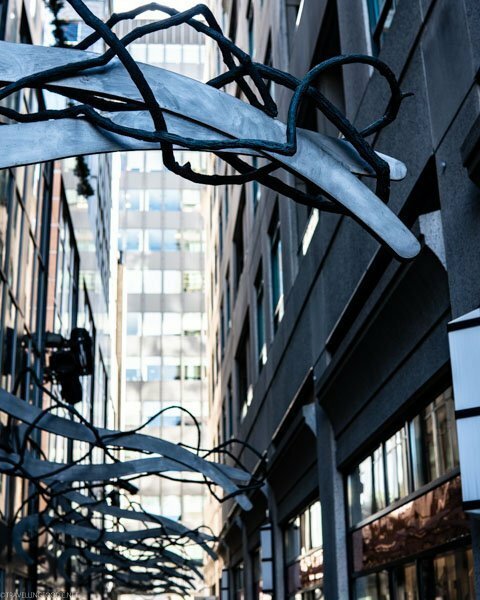 The tour also brought us to some back alleys and hidden gems that I never knew about. It’s really quite interesting what you’d learn and see when going on a walking tour like this. 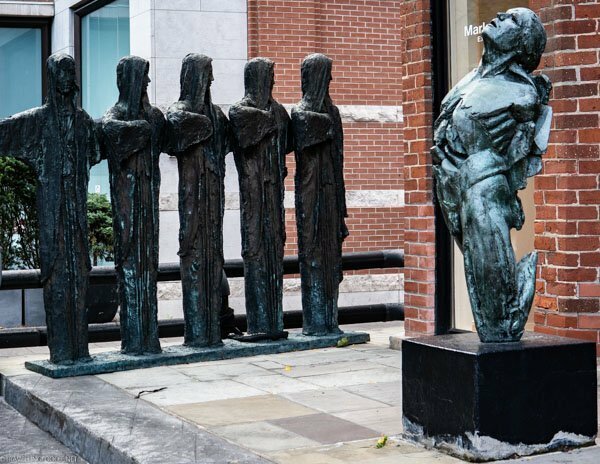 Gallery Gevik features a variety of artists that range from high realism to lyrical abstraction, and a growing collection of important historical works. 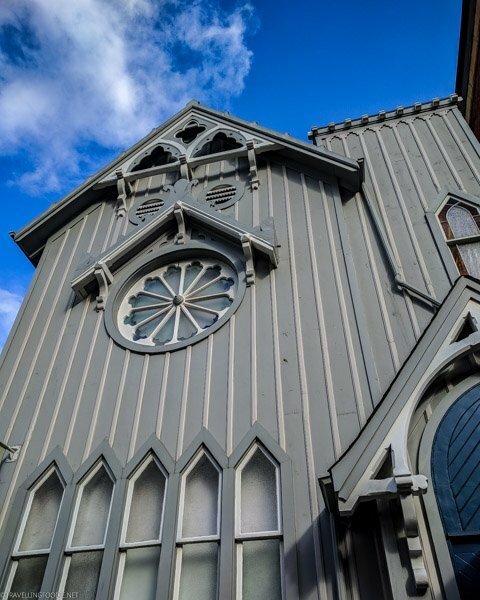 With a stage, exhibit space, and fine acoustics, the Heliconian Hall has served as a centre for artistic activity, promoting the place of women in the arts in Canada. 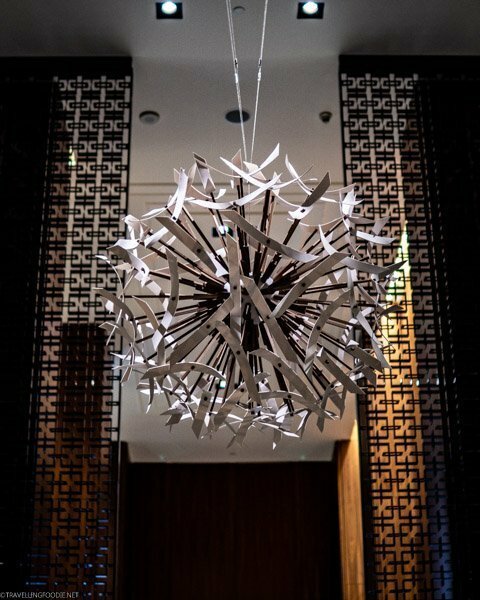 We also checked out two hotels in the neighbourhood: Four Seasons Hotel and The Hazelton Hotel. 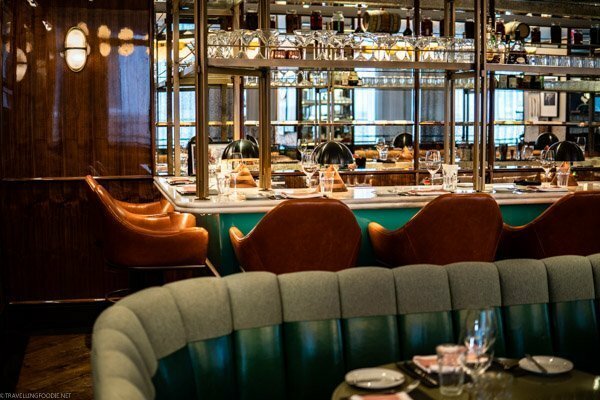 Cafe Boulud’s dining room has a vintage-inspired ambiance envisioned by London-based designer Martin Brudnizki. 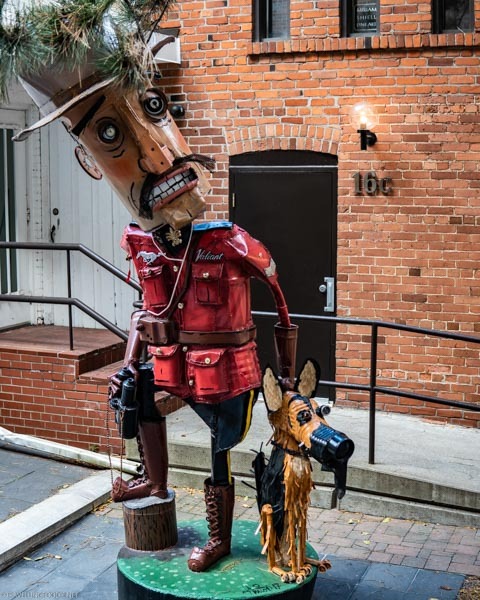 Hope this gave you an idea on how to spend an afternoon in the historic Yorkville neighborhood! 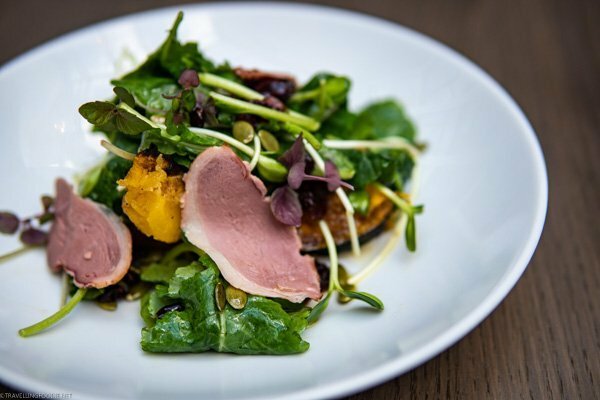 What are your favourite things to do and places to eat in Yorkville? Huge thanks to the International Food Wine Travel Writers Association (IFWTWA) for organizing this afternoon tour. As usual, reviews and opinions are entirely our own.